You can order custom flags online! Click here to visit our Custom Flags shopping category for more product details, including pricing for our custom flags. In addition to standard rectangle shaped flags available in popular sizes such as 12"x18", 16"x24", 2'x3', 3'x5', 4'x6', 5'x8', 6'x10', 8'x12', 10'x15', etc. we offer attention grabbing advertising flags in a variety of sizes and shapes. 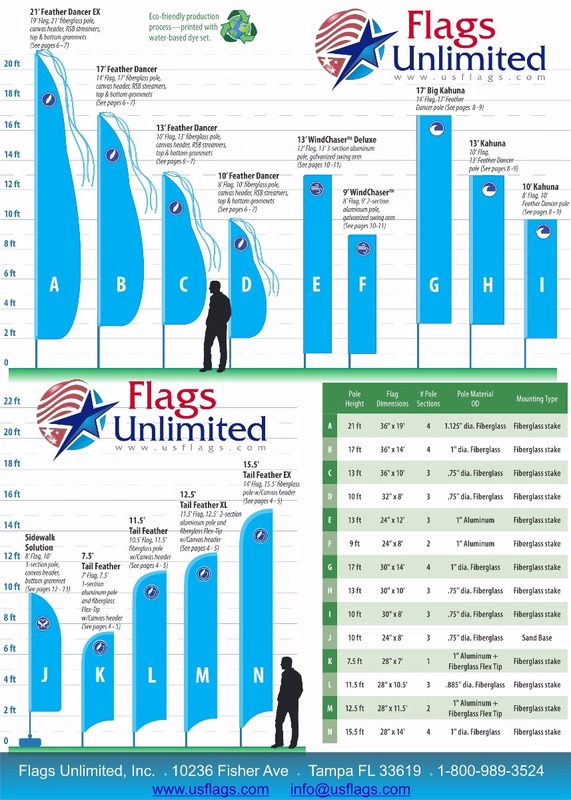 Below is a graphic showing our available custom advertising flags. Available in a variety of popular sizes and shapes, these eye catching flags are sure to grab attention to help promote your business or event! No matter if you need 1 or 1000 flags, Flags Unlimited can create the flags you need! Email us today for a quote on your custom flag needs! Flags Unlimited, Inc. will reproduce any design you need including corporate logos, trademarks, organizational emblems or your custom design on a variety of materials, including tough SolarMax™ nylon. Designs can either be appliqued (sewn) or digitally printed by our skilled operators. We also offer the latest technology, allowing the reproduction of photo-quality images to be placed onto a flag or banner. Delivery time can vary depending upon process used and quantity needed. We strive to meet your deadline with each custom order. Below, please find a more detailed description of each process. For examples of our custom projects, please view our gallery above. For a quote on your custom flag, fill out our online form below, or download a custom flag worksheet and fax your request here. Our Custom Flag FAQ can be found here. Designs are sewn onto heavyweight SolarMax™ nylon. All seams are double-stitched while fly hems have multi-stitching with extra-strong thread. The finest workmanship in the industry assures skillful reproduction of your artwork. We offer a wide selection of colors to assure a coloring consistent with your design. Applique flags are generally have a "single/reverse" construction, i.e., your design appears correctly on the front and reverse on the back. If it is desired that the design appear correctly on both sides, two flags are sewn back-to-back. Applique flags can be used indoors or outdoors. Pricing for applique flags is based upon the complexity of the design. In order for us to give you a firm quote, please submit your design to us! You can submit your design via e-mail (Windows™ formats only), fax (813-654-4272 - 24 hour FAX) or mail. Please view our gallery for examples. This process combines state of the art digital technology with old-world craftsmanship to produce a clean, crisp and faithful reproduction of your most intricate designs. This process mimics a screen-printed flag, but allows for a smaller quantity of flags with greater detail, multiple colors and photographic type images. We can produce 1 flag or 1000's of flags with this process! NO MINIMUM QUANTITY! Please view our gallery above for examples of this process! We also make custom vinyl banners! Whether you need a custom saying, company or team logo, or just about anything else... we can put it on a banner! Just email or call 1-800-989-3524 with your banner needs for a prompt quotation!